Watch live on BBC One, BBC One HD, Red Button and online; listen on BBC Radio Wales, BBC 5 live Sports Extra, BBC Radio Cymru & online; live text commentary on BBC Sport website; watch again on BBC iPlayer; highlights on Sunday's Scrum V & BBC Two 2315. Jonathan Davies has given his backing to interim Wales coach Rob Howley's decision to name his team to play Italy a week earlier than planned. Howley on Tuesday named an unchanged starting XV from the 16-6 win against France to face the Italians in Rome on 23 February. Davies says it means the players can just concentrate on the game. "It's a good thing for us to prepare and for us to have more time to do that," said the Scarlets centre. "It's just an opportunity for the boys to have more time to prepare as a XV really. "You know weeks come round quickly and you don't have many sessions together, this has given the boys an opportunity to run together and just get more familiarity and fluidity. "We know what's needed now. We can just get on with the game." Davies was one of the Welsh players criticised after the 30-22 defeat by Ireland in the opening match of the Six Nations. But he played a prominent role, particularly in defence, as Wales beat France to end a run of eight successive defeats. 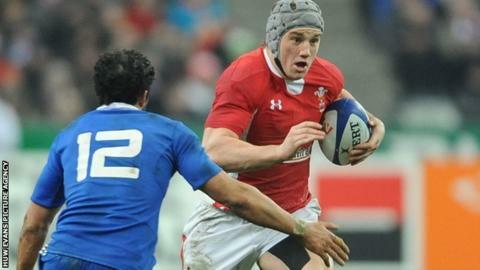 Now the 24-year-old cannot wait to tackle the Italians at the Stadio Olimpico in Rome - a new venue for the Welsh side. "It looks an incredible stadium," said Davies. "The boys will be slightly excited because it looked a cracking atmosphere. "The boys love playing in front of an atmosphere. That's what we want to do. "When we play in Cardiff the noise and the atmosphere is brilliant and it was the same again in Paris and the boys I think thrive on that hostile environment." Wales: L Halfpenny; A Cuthbert, J Davies, J Roberts, G North; D Biggar, M Phillips; G Jenkins, R Hibbard, A Jones, A Coombs, I Evans, R Jones (capt), J Tipuric, T Faletau. Replacements (TBC Tuesday, 19 February).